Bestseller | Doris S. Michaels Literary Agency, Inc.
Harry Kraemer delivers his four value-based leadership principles at TEDx event organized by Kellogg student. Watch Kraemer’s 15-minute talk starting at the 1:01 mark. Try these neck decompressing exercises from the book The MELT Method by Sue Hitzmann and Debbie Karch! 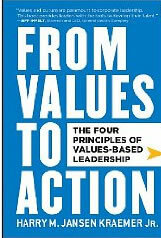 From Values to Action hit #1 on 800ceoread’s Business Book Bestseller List for the month of July.